Want to involve young people in parish life? Chanted Vespers in Washington, D.C.
Should We Confront the Purveyors of Bad Music? Can Catholics Begin to Care about Music? 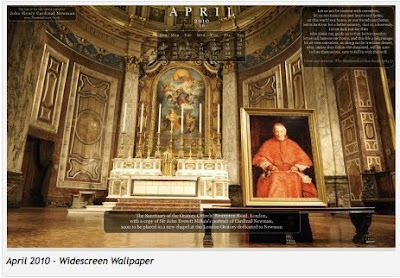 The last time we posted this it proved rather popular, and before we enter the Triduum I wanted to make mention of the new desktop wallpaper calendar for April which has been made available by the site for the cause of the canonization of Cardinal Newman. The calendar will remind you to pray for Newman's cause, and also give you a very nice view of both the splendid sanctuary of the London Oratory, and Sir John Everitt Millais' portrait of Cardinal Newman. 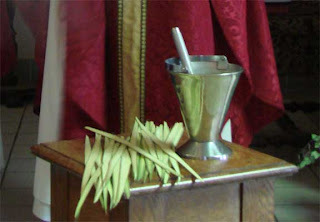 Before we head into the Triduum, a few last things surrounding Palm Sunday. 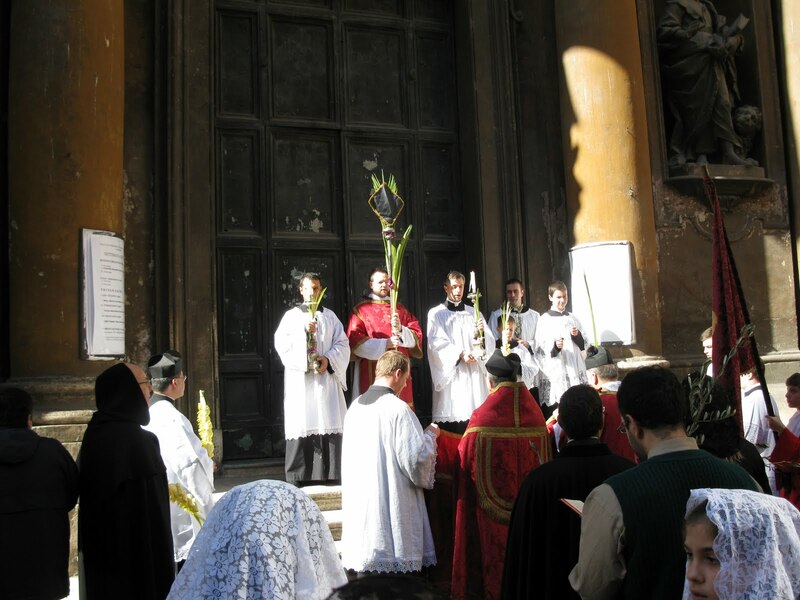 The first is that the site of the Dominican Province of St. Joseph has posted a piece, The Riches of a Dominican Holy Week: Palm Sunday. The piece was written by Fr. Dominic Legge, O.P. They will be putting up similar pieces in the course of the Triduum. 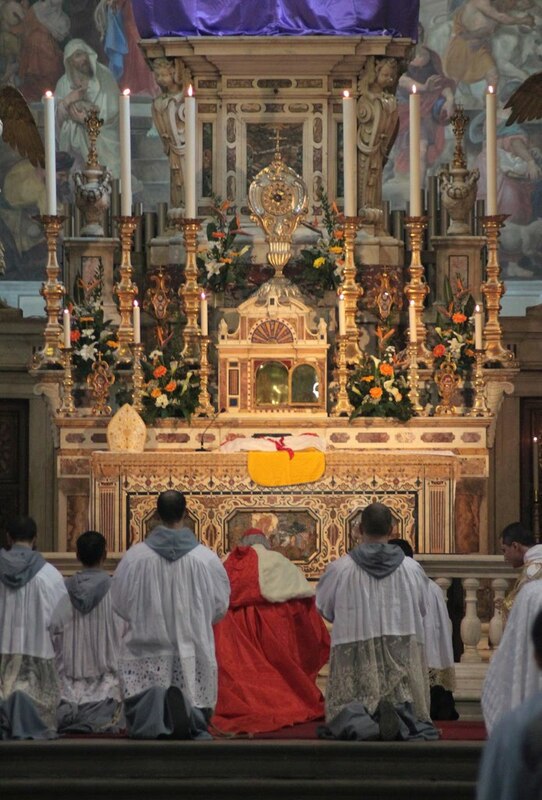 The second item are some images from the Mercedarians in Philadelphia, who use the modern Roman liturgy. The stational church for today needs little in the way of introduction and was already covered earlier in our series. Do however see this beautiful image of the basilica. One of the monks has put together a short video report from the conference, which includes an interview with the postulator of the cause. 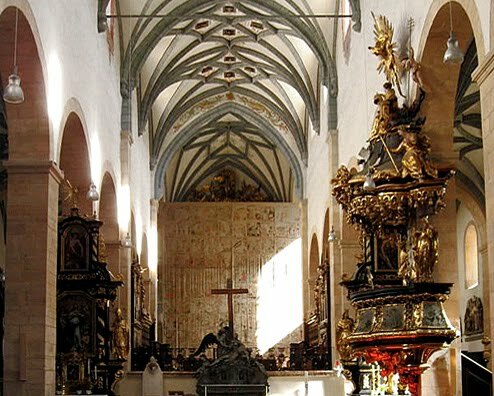 Amongst the topics that arise are the Abbot's work to implement the liturgical reform in continuity with the tradition. To set the record straight with regards to the efforts made by the church to heal the wounds caused by clergy sexual misconduct. The Catholic Church is probably the safest place for children at this point in history. The identity of St Prisca is uncertain. One tradition claims that she is identical with Priscilla, who is mentioned in the New Testament, another that she was the daughter of Aquila and Priscilla. In the Acts of the Apostles (Acts XVIII, 1-4), it is written that St Paul stayed with Aquila and Priscilla, Jewish Christians exiled from Rome, when he was in Corinth and again in Ephesus after they had moved there. Later, they were apparently able to move back to Rome, as St Paul sends his greetings to them there (Romans 16, 3-5). The tradition claims that this was her house. This has been challenged, and Prisca may be another woman altogether. No private house has been found underneath the church - in fact, a temple to Mithras was found during excavations in 1940 and 1958. It has, however, been established that Christian worship was established here at an early time, as ancient terracotta lamps with the chi-rho monogram has been found. The commonly accepted date for the church is the 4th or 5th century. The first documentary evidence of the church is from 489, when it is mentioned in an inscription. It is also mentioned in the list from the Roman Synod of 499. The church has been altered several times throughout the centuries, and the only clearly identifiable ancient remains are the columns and the parts that are underground. It was damaged by the Normans under Robert Guiscard in 1084. In 1094, Pope Urban II invited monks from Vendõme to serve the church. 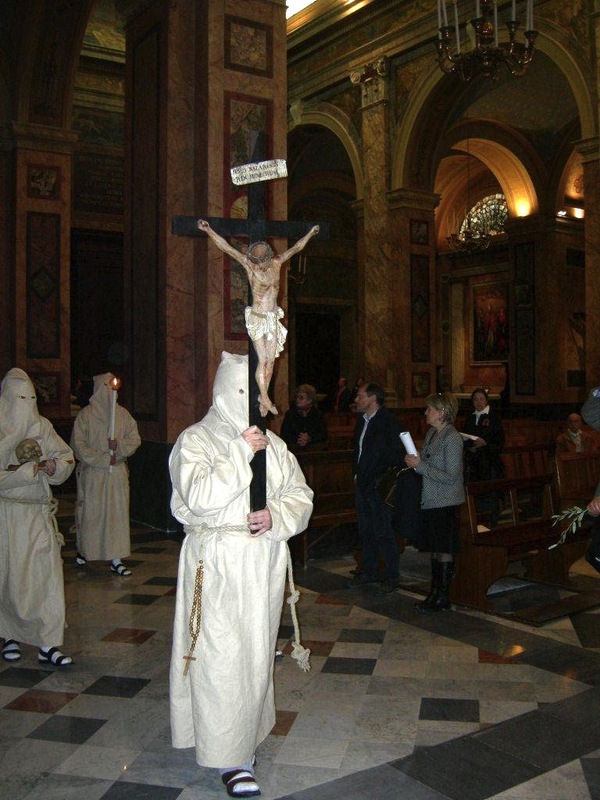 The Catalogue of Turin, c. 1320, mentioned that the church has black monks ("monachos nigros"), which must be a reference to the black-clad Benedictines. 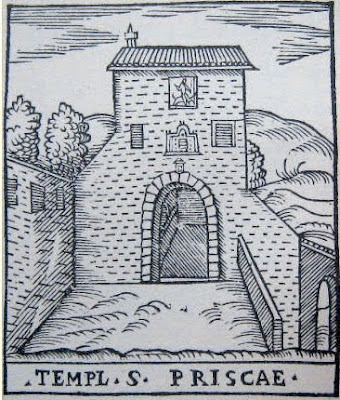 The order left the church in 1414. 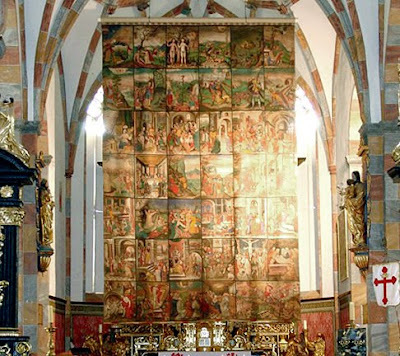 The most comprehensive restoration took place in 1660. 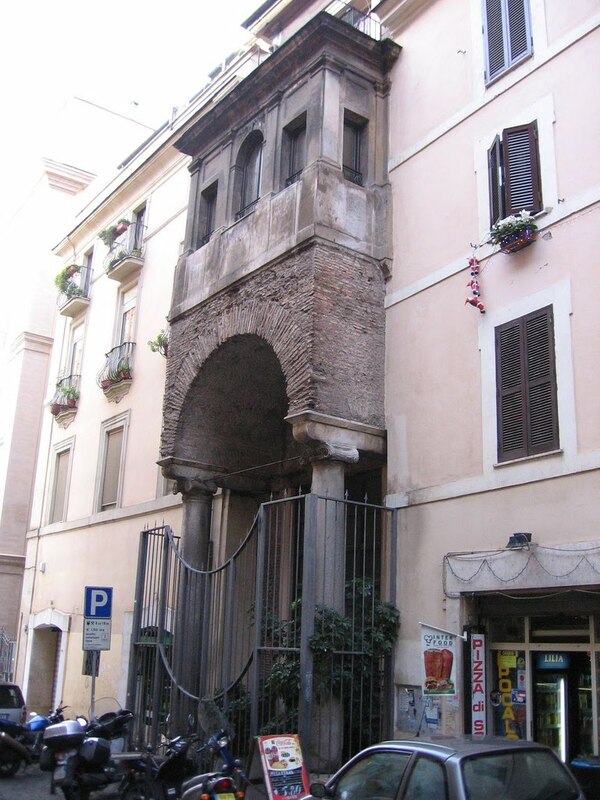 The ancient columns were embedded in pilasters, and a new façade was constructed. While only this very day I suggested that I would only speak once on this topic, I have determined to make an exception for this: Long Applause for New York Prelate Who Defends Pope. Archbishop Timothy Dolan of New York brought hearty approval from a standing-room-only crowd at St. Patrick's Cathedral on Palm Sunday when he defended Benedict XVI against "unrelenting insinuations" in the scandals of sexual abuse. The archbishop asked the congregation for a couple of minutes of patience at the end of the lengthy Mass, and then said the "somberness of Holy Week is intensified for Catholics this year" by a "tidal wave of headlines about abuse of minors by some few priests, this time in Ireland, Germany, and a re-run of an old story from Wisconsin." "What deepens the sadness now is the unrelenting insinuations against the Holy Father himself, as certain sources seem frenzied to implicate the man who, perhaps more than anyone else has been the leader in purification, reform, and renewal that the Church so needs," Archbishop Dolan stated. 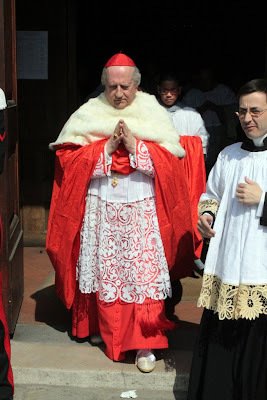 The 60-year-old prelate suggested that Sunday Mass is "hardly the place to document the inaccuracy, bias, and hyperbole of such aspersions," but it is "the time for Catholics to pray for Benedict our Pope." According to the Associated Press report of the archbishop's words, the congregation responded with 20 seconds of applause. 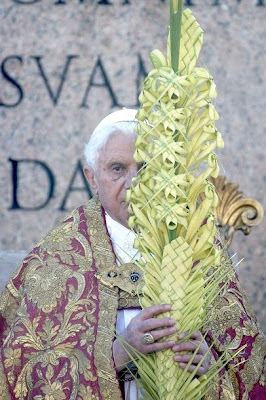 Archbishop Dolan suggested that Benedict XVI is suffering "some of the same unjust accusations, shouts of the mob, and scourging at the pillar, as did Jesus. Read the remainder of the article on Zenit. 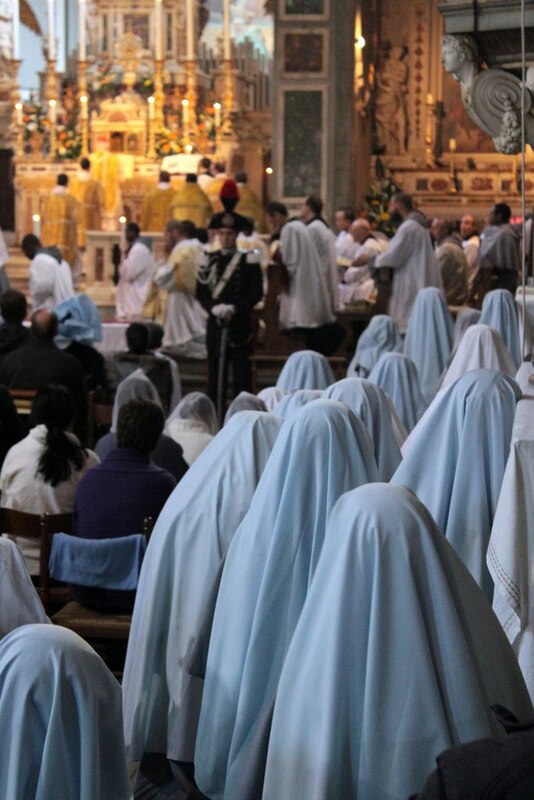 Throughout Lent, Daniel Mitsui of The Lion and the Cardinal has shared some rather interesting images of Lenten veils. 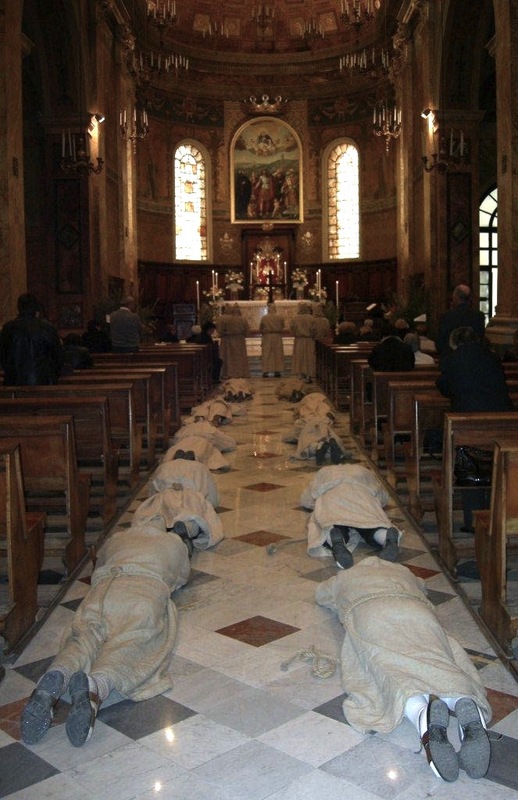 Our friends over at Rinascimento Sacro inform us that they have their own photos up of the recent ordinations of eight for the Franciscan Friars of the Immaculate. As always, their photos are of excellent calibre. This week past, it was evident that yet another wave and renewed attempt to drag the Holy Father into the mire that is sexual abuse scandal was beginning to mount, and accordingly I had thought about writing a reflection on this in the light of Holy Week. In the end, I determined that likely more than enough commentary could be found on any number of sites and perhaps there was something to be said for some calm and "business as usual" as a form of respite. While I still generally subscribe to this thought and do not intend to dwell on this subject beyond this brief reflection, yesterday, as we showed some images from the Papal Mass of Palm Sunday, the matter arose in the comments in the light of some public protests which followed from the frenzy which many in the media seem only too intent on stirring up; the dismay was tangible. Accordingly, I thought I perhaps should present my brief meditation as I originally intended after all. Evidently, the scandals themselves are matters which need to be dealt with; they are indeed filth in need of cleansing -- and this should be clearly stated and understood. Awake, O sword, against my shepherd, against the man who stands next to me," says the LORD of hosts. "Strike the shepherd, that the sheep may be scattered.."
While this prophetically refers to the events surrounding the life and person of Our Lord Jesus Christ, I believe we might find an analogous application in relation to the Vicar of Christ in this present situation -- one that perhaps gives us a broader spiritual context in which to understand and make sense of these goings on; one which emphasizes the fact of the real spiritual warfare which we face. In that light, and in the light of these events in the life of Christ Himself, perhaps seeing His Vicar so similarly struck should come as little surprise. 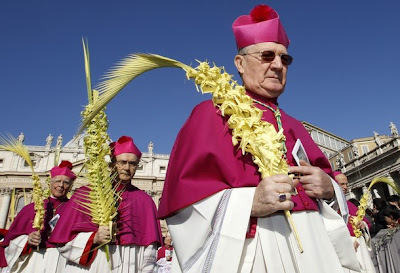 Further, in the Mass of Palm Sunday, we read the Passion narrative and in the coming week we will again recount this, and be brought into a further meditation on the events of the Passion and Death of Our Lord. We hear of how one of Christ's own apostles betrayed Him and how others, through their fear, temporarily fell by the wayside. This brings to mind how, even in Christ's own time and within the body of His own apostles, the frailties and sinfulness of a fallen humanity have been present and have been a source of pain and affliction. This reality is good to recollect as we struggle to understand how such scandals can so painfully inflict Christ's Church in our own time. We will also hear recounted how Christ was persecuted; how he was insulted, abused, mocked and suffered great trials. 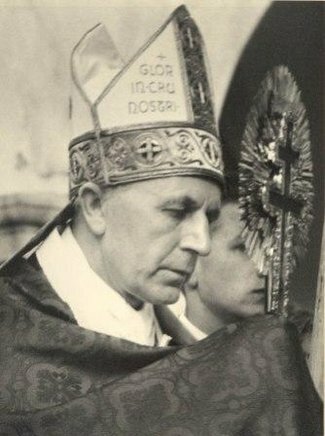 Let us here recall how, in the history of the Church, it has often been found to be the case that the disciples must follow in the footsteps of their Divine Master -- and such is never found to be in vain or without some greater purpose. 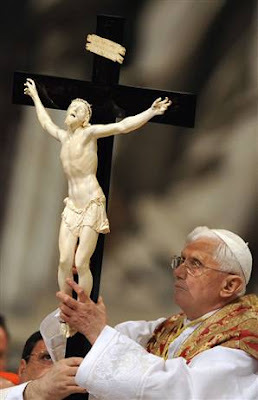 Is not Pope Benedict himself presently bearing the cross of similar abuses and attacks? Let us then carry the Holy Father by our prayers now as he bears this cross; as he bears with the abuses and buffets which Christ Himself bore to an even greater degree. Let us pray for him, support him and publicly defend him, as he, our earthly shepherd, is indeed struck by the sword and surrounded by wolves. Let us not be scattered but instead rouse ourselves, taking heart and taking courage, remembering that the ploys and attacks of Satan are ultimately in vain for ultimately, in Christ, the battle is already won and He reigns victorious. The first church here ... was one of the tituli, the first parish churches of Rome, known as Titulus Praxedis. 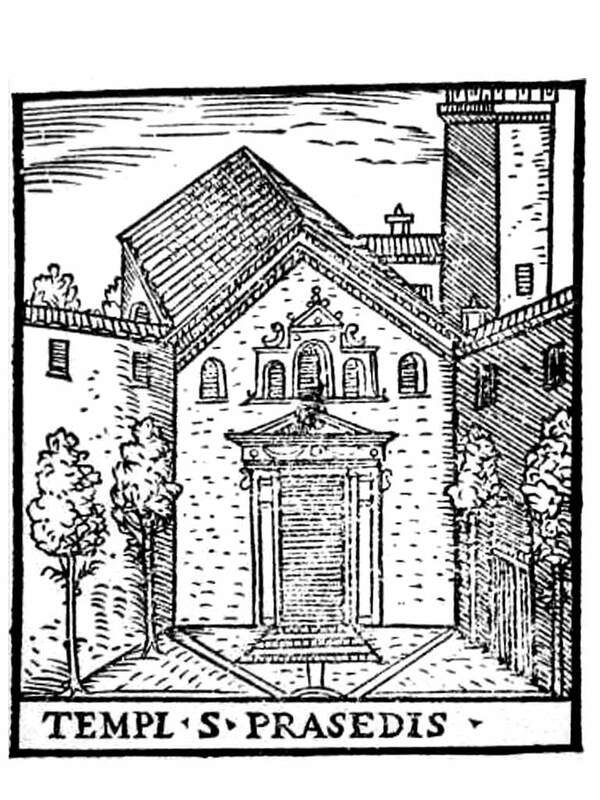 The first definite mention of the church is from 489. The present church is the one built by Pope Adrian I c. 780, completed and altered by Pope St Paschal I c. 822. It was enlarged at that time mainly to serve as a repository for relics from the catacombs. 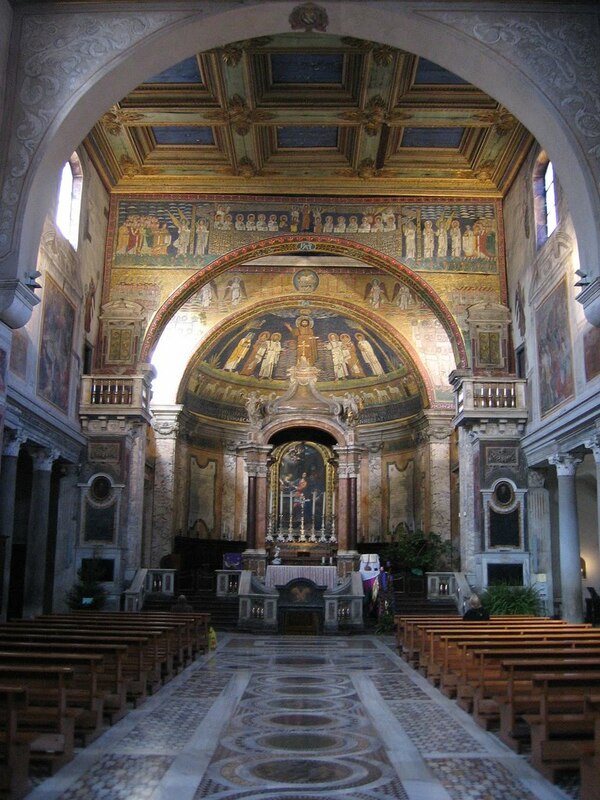 It was the first church in Rome since Santa Sabina to be modeled on San Pietro in Vaticano. It was granted to the Vallombrosian Benedictines by Pope Innocent III in 1198. Some changes were made in the 16th century by St Charles Borromeus, with Martino Longhi the Elder as architect. His restorations were not altogether successful. 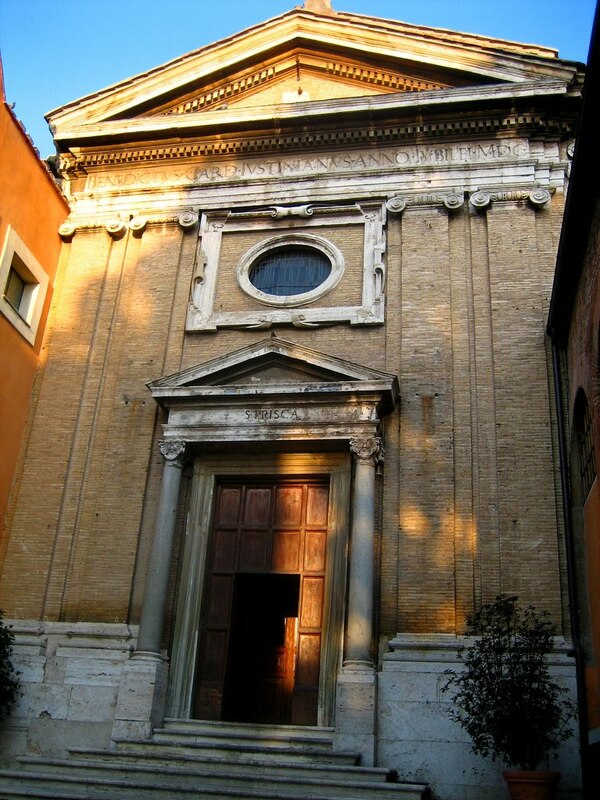 Later, Ludovico Cardinal Pico della Mirandola also had it renovated. The sanctuary and crypt were rebuilt in the 18th century. Brother Stephen of the Cistercian Monastery of Our Lady of Spring Bank, has a short piece up on the Blessing of the Palms in the Cistercian liturgy this weekend. Everyone hates site redesigns because they involve unfamiliar environments, usually contain many bugs, and mostly seem like pointless reshuffling, at least to the end user. I have no doubt that many people will feel this way about the new MusicaSacra.com, but I invite you to visit in any case. We what gain is mostly behind the scenes: better fuctionality, a better development environment, a more stable database, and a more reliable infrastructure. Essentially, progress would have been impossible without this shift. Painful but necessary! At least now, the registration forms work for the Colloquium. 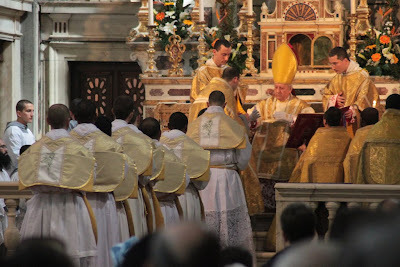 As recently noted, Franc Cardinal Rodé, Prefect of the Congregation for Institutes of Consecrated Life and Societies of Apostolic Life, celebrated, on March 25th, a Solemn Pontifical Mass which saw the ordination of eight friars of the Franciscan Friars of the Immaculate in Florence. Here are a few photos from those ordinations. More photos are available from James Bradley. 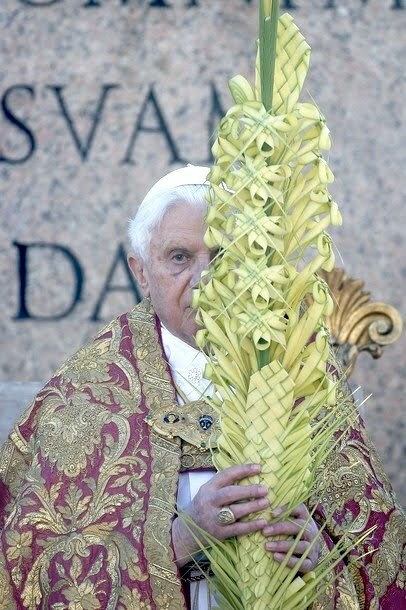 "Hosanna Filio David, Benedictus Qui Venit in Nomine Domini"
Our consideration of the stational churches now shifts to those of Holy Week. 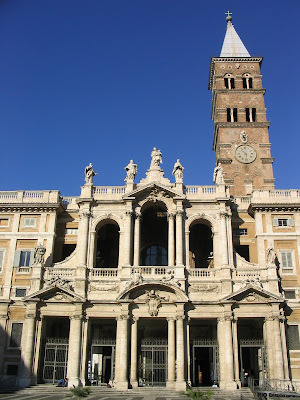 Today's station is the same as that of the First Sunday in Lent, the Archbasilica of St. John Lateran. Accordingly, we shall keep this entry brief. Read the Churches of Rome wiki entry here. Before the NLM is deluged with photographs of Holy Week celebrations, I thought I would share some final images from Lent. These were taken on March 7, the third Sunday of Lent, at the Carmel of Jesus, Mary and Joseph in Valparaiso, Nebraska, very close to the F.S.S.P. 's seminary in Denton; the Mass was celebrated by members of the Carmel of the Immaculate Heart of Mary in Powell, Wyoming. Both of these institutions are very much dedicated to the contemplative side of the Carmelite tradition. The women's house in Valparaiso follows the liturgical traditions of the 16th-century Discalced Reform in utroque usu; the men's house in Wyoming, however, uses the ancient Carmelite liturgy, adopted by the friars from the Latin-rite Canons of the Holy Sepulcher at the time of the Crusades. The men who served as deacon and subdeacon are studying for the priesthood at OLG; they were both ordained deacon the previous day by His Excellency Arthur Seratelli, Bishop of Paterson, N.J. 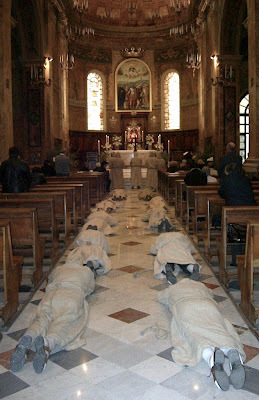 It is greatly encouraging to see a young religious order striving to maintain the liturgical customs proper to its own tradition. The Carmel of Jesus Mary and Joseph. The dome of the church and the top of the bell tower were originally copper-colored, but have turned black in the snowy Nebraska winter, to pleasing effect. A bit of rehearsal, before the lights in the church are turned on. The Collect. Note that the deacon is bowing to the celebrant as he says "Dominus vobiscum". The acolytes often stand at the altar with the major ministers, similar to the custom of the Ambrosian Rite. The burse, corporal and chalice are brought to the altar, and the latter is filled with wine and water, during the Mass of the Catechumens. Here one can see the celebrant blessing the water while the deacon moves the Missal, just prior to singing the Gospel. The celebrant listens to the Gospel, as in the Roman Rite. 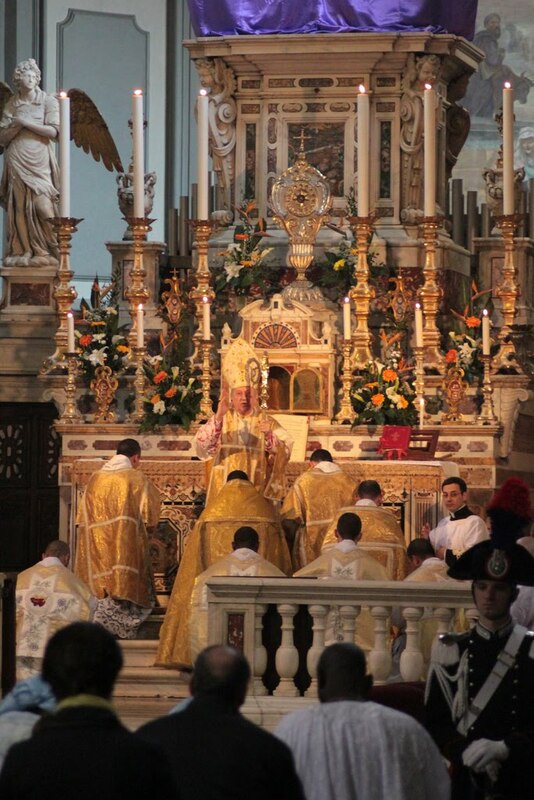 The burse is on the altar, the corporal spread; the filled chalice is covered with the pall and chalice veil. The Offertory is of course shorter and simpler than that of the Roman Use, since the chalice is already prepared. As the major ministers double the Sanctus, an acolyte brings the humeral veil for the subdeacon. Also notice the acolytes kneeling with their candles in hand before the altar, as is so often seen in medieval pictures of the Mass. The subdeacon, kneeling on the predella, receives the paten, as the priest begins the Canon of the Mass. Right before the Consecration. Notice that the deacon remains on the priest's left side, while the subdeacon comes up and kneels on his right. "Ejusdem Christi Filii tui tam beatae Passionis." As in many medieval uses, the priest extends his hands in imitation of Christ on the Cross immediately after the Consecration of the Chalice. The Peace is given without turning away from the Sacred Species on the Altar. 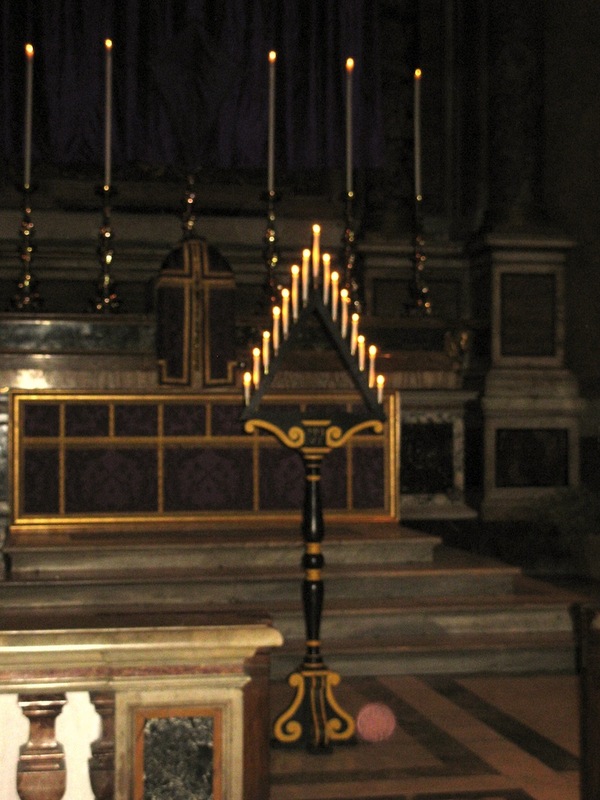 According to the Ambrosian liturgical tradition, the Saturday after the 5th Sunday in Lent is known as Sabbatum in traditione Symboli or Saturday of the handing over of the Symbolum, where "Symbolum", again in the Ambrosian liturgical tradition, is the common name for the Creed. 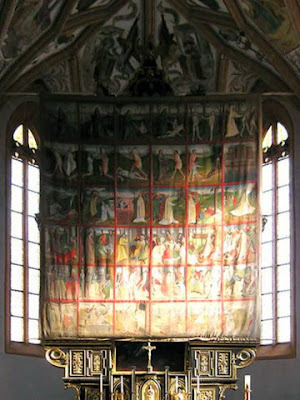 This day, as we shall see in the following parts of this article, is liturgically very similar to a normal Lenten Saturday, but, as I mentioned in a previous post, the liturgical colour shifts this day from black/morello to red, giving a visual sign of the beginning of the time immediately before the Passion and Death of Our Lord, called "Hebdomada Authentica" -- which should be translated as "Eminent Week", in the same sense used by Eastern Rites, that call it "Great Week" (cfr. Msgr. 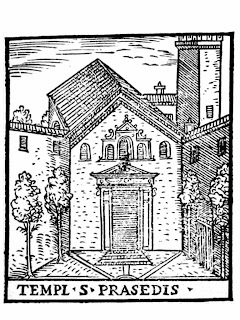 M.Navoni, La Settimana Santa Ambrosiana). As a matter of fact, this Saturday, in the complex pattern of Ambrosian Lent, is both the end of the long catechetical preparation of the catechumens for the Mysteries of the Christian Faith, and the beginning of the solemn commemoration of the last days of Our Lord on the earth before His salvific Death on the Cross. This gives us an occasion to sum up some of the most important features of Ambrosian Lent until the Sabbatum in Traditione Symboli. As a preliminary note, it should be noted that, in the Ambrosian Rite, like in most Catholic liturgical rites, during the time immediately before Easter, the liturgy retains its most ancient and venerable traditions, if not intact, then at very least visible. So it is not rare to find a testimony of the customs proper to the Milanese Rite in text written by St. Ambrose himself, who considered them as customary already by his time. As I mentioned in my previous article, all weekdays in Lent are feriae, according to the Ambrosian tradition. In all post-Carolingian sources, the text of the propers of weekday Masses during Lent - excluding only the ordo lectionum - are entirely borrowed from the Roman Rite. 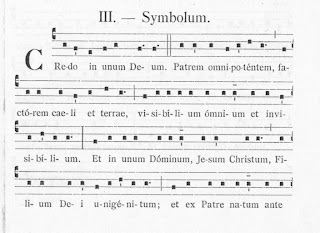 An important study by Abbess Judith Frei about the Ambrosian-monastic Missal of St. Simpliciano (Judith Frei, Das ambrosianische Sakramentar D 3-3 aus dem mailändischen Metropolitankapitel), has given good evidence that, before the Carolingian reform of liturgical books, there existed an Ambrosian libellus quadragesimalis with prayers used throughout Lent for all weekdays. This would give a strong resemblance to the pattern of the Gallican liturgical books. 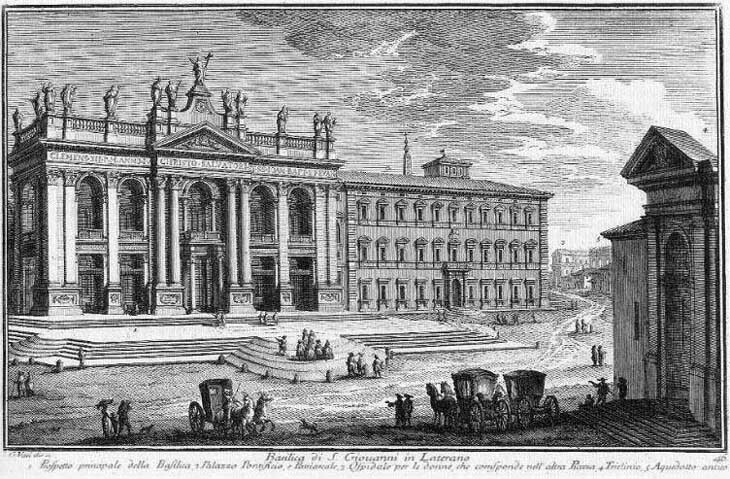 After the Carolingian reform, under influence of the Roman custom for every weekday in Lent to have its own propers, the older propers were replaced with the newer, "Roman" ones. We have already focused on the strong catechetical character of Lenten Sundays in the Ambrosian Rite in a previous article, which can be read here. Lenten Saturdays, according to St.Ambrose's own words, were considered semi-festive days, and the fast was suspended (De Elia et jejunio, 34). Have you not read what David did when he was hungry, and they that were with him: How he entered into the house of God, and did eat the loaves of proposition, which it was not lawful for him to eat, nor for them that were with him, but for the priests only? Or have ye not read in the law, that on the sabbath days the priests in the temple break the sabbath, and are without blame? The special character of these semi-festive days is also attested by the three readings of the Mass, and by the presence of the Antiphona post Evangelium. On Saturdays there also took place the scrutinies of the catechumens, as suggested by the Gospels for the Mass of the day. ...And Jesus said to them: A prophet is not without honor, but in his own country, and in his own house, and among his own kindred. And he could not do any miracles there, only that he cured a few that were sick, laying his hands upon them. ...And they cast out many devils, and anointed with oil many that were sick, and healed them. Finally, there came the Sabbatum in Traditione Symboli. According to St. Ambrose's testimony in a letter to his sister, St. Marcellina (Epist., 76,4) the Symbolum was originally handed over to the Catechumens on the Sunday before Easter. They had to learn it by heart and they were instructed to not write it down, according to the well-known "disciplina arcani", like St. Ambrose writes (Explanatio Symboli ad initiandos, 9 passim). The scrutinies probably also took place on Sundays. 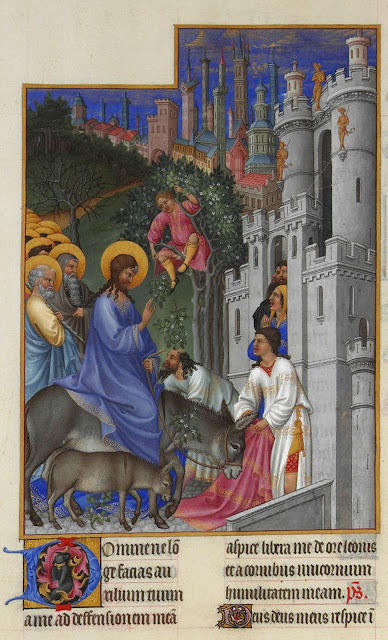 Later, perhaps in the 5th century (see Navoni), under the strong influence of the liturgy of Jerusalem, the Sunday before Easter became Palm Sunday, and both the scrutinies and the Traditio Symboli were anticipated on the Saturday. A special feature of the Mass of this day is that, unlike all other ferial Masses, the Credo is sung. 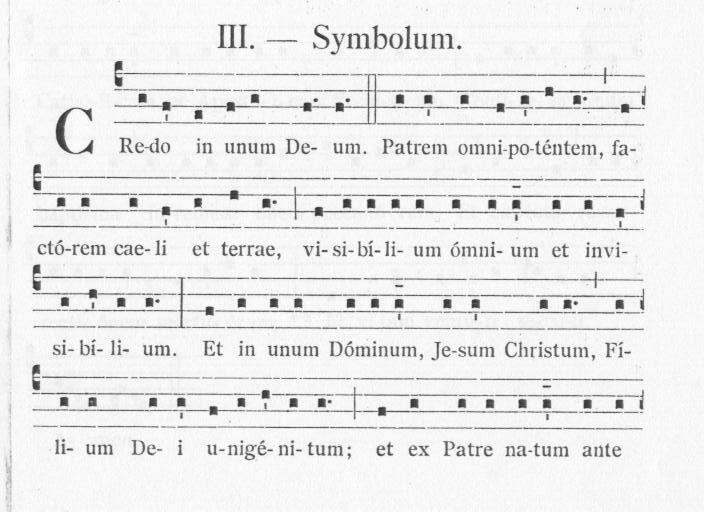 As I mentioned in a previous post, the Symbolum has, in the Ambrosian Mass, a strong mystagogical character, coming immediately before the Canon. As a perfect parallel, the Mass dedicated to the ceremony of the Traditio Symboli stands immediately before the beginning of "Eminent Week" which leads the catechumens, and all the Christian faithful, into the "mystery" of the Passion, Death, and Resurrection of Our Lord Jesus Christ. 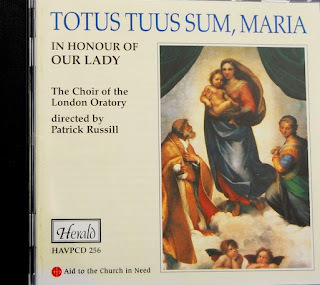 When it comes to renaissance polyphony, most are no doubt familiar with the recordings which are available for purchase from such excellent groups as The Tallis Scholars or The Sixteen; recordings which certainly deserve our interest and provide much edification. But I was particularly pleased to be made aware of some recordings from the famed choir of the London Oratory -- more popularly known as the Brompton Oratory. For those who have been to the London Oratory, you will no doubt know of their renown in the area of the sacred liturgy -- and if you have not been, you will probably at least know it by reputation. 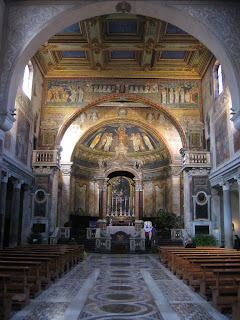 Their approach to the liturgical rites and the beauty of the sacred architecture of the Oratory church itself is also matched by the calibre of the choral tradition found therein. Four of their recordings were recently sent to me. 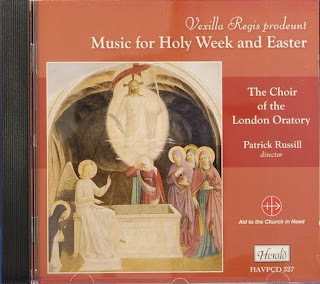 One which particularly caught my attention was Vexilla Regis Prodeunt: Music for Holy Week and Easter. 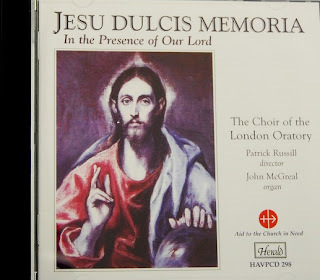 As I write, I am listening to this particular recording, which was recorded in 2006 at St. Alban's Church in London, under the direction of Patrick Russill, the Director of Music at the London Oratory. The quality of the recording itself and the execution of the music is superb. While Holy Week is already upon us, these selections would certainly make for good listening throughout the Easter Season and the rest of the year as well. 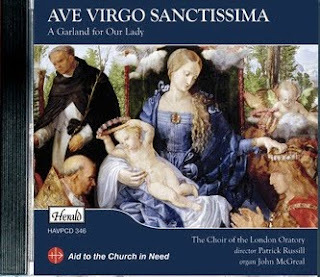 If you enjoy Gregorian chant and particularly renaissance polyphony, you will most certainly want to add these CD's to your collection. 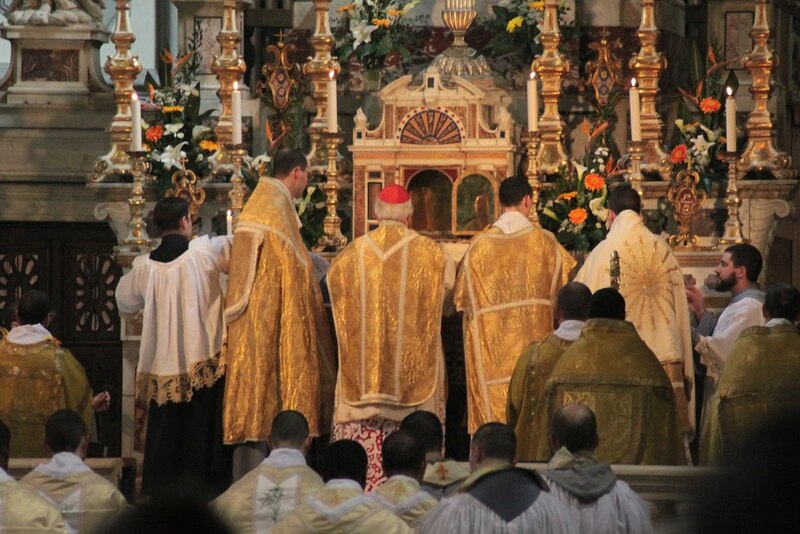 In so doing, you will be showing your support for the liturgical pursuits of the London Oratory, partaking in a taste of their liturgical life, and further giving your financial support to a good cause, Aid to the Church in Need, who offer support to the faithful in areas of oppression or impoverishment. You may also wish to browse some of the other recordings made available through Aid to the Church in Need: Aid to the Church in Need Shop.